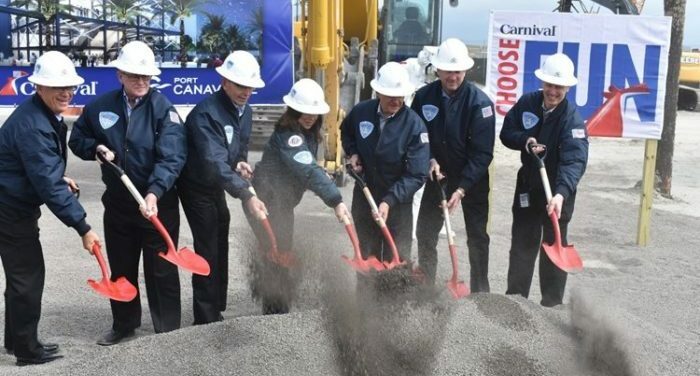 During a ceremony held on March 18, the Canaveral Port Authority and Carnival Cruise Line officially broke ground for construction of Port Canaveral’s new Cruise Terminal 3 complex. The new terminal, called the Launch Pad, will be the home of Mardi Gras, the cruise line’s newest and most innovative ship, beginning in 2020. The $163 million terminal project is planned to be completed in May 2020 and will be ready for the arrival of Mardi Gras to its year-round Port Canaveral homeport in October 2020. The contract to build the two-story, 187,000 sq. ft. terminal facility and adjacent six-story parking garage was given to Merritt Island, Florida-based Ivey’s Construction. The terminal will include a high-tech baggage processing facility and a state-of-the-art check-in and security area on its second floor, with kiosks and seating for 1,700 guests. The six-story 692,000 sq. ft. parking garage will be able to accommodate 1,800 vehicles. Construction of the cruise terminal’s marine facility started in 2018, with a contract awarded to Titusville, Florida-based contractor RUSH Marine to remove the current pier structures at the site and build a new 1,309-foot-long berth for Mardi Gras. The completion of the project is expected during December 2019. Port Canaveral’s Launch Pad will be homeport to Carnival’s largest and most innovative cruise ship, Mardi Gras, which will be powered by LNG. Mardi Gras will arrive at Port Canaveral in mid-October 2020 and will feature BOLT, the first roller coaster at sea, 20 passenger decks and six distinctive theme zones of fun, dining and entertainment.